as the head of the delegation made an official visit in the country between the 31st August and 3rd September 2016. H.E. Sir Mohamad Bassam Safieh – General Director and Sir Fabrizio Palmarini – First counsellor, Head of the Department of Legal and International Law. 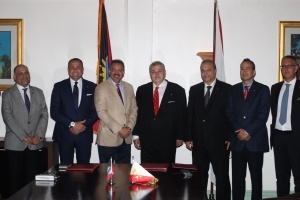 Antigua and Barbuda and the Sovereign Order of Saint John of Jerusalem, Knights of Malta, Federation of the Autonomous Priories (KMFAP) on the 2nd September 2016.